1. Added the cursor button in drawing mode which allows users to click the mouse cursor without drawing. 2. Added command line interface (/record, /stop, /shutdown, /nosplash, /safemode, /reg). 3. 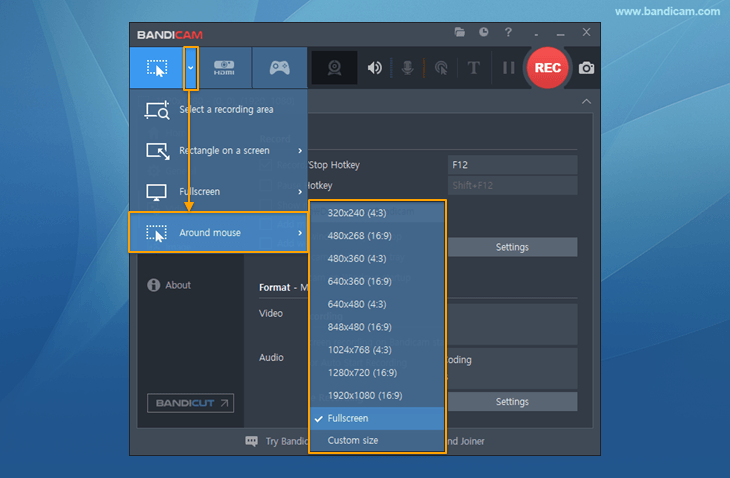 Bandicam now supports Vulkan 1.1 in Game Recording Mode. 4. Added the full-screen option in the Around Mouse recording mode. 5. Improved the Output folder selection UI. 6. The size selection menu in the Rectangle recording mode has changed (854x480 -> 848x480, 480x270 -> 480x268).